Our hemp/cotton doublers provide additional absorbency. Made in USA. Our GMD Hemp Doublers are three layers of 55% hemp, 45% organically grown cotton. Hemp is very absorbent and technically more absorbent than cotton alone. I can't tell in real life and in my own testing, but that is what I am told. It's not the jersey kind, it's the thicker more absorbent fleeced kind. It’s mill washed so it won’t shrink too much. Small Hemp Doublers are 4 inches wide by 11 inches long before washing and the Long are 3 inches longer but the same width, before washing. These do not shrink much in width; they shrink about 1 to 1.5 inches in length. These are trim. Wonderful on infants, but also good on older babies when you need a bit more absorbency and don't want to add bulk. It is narrow, so not it's bulky between the legs. The narrowness also keeps the fit correct of many fitted diapers since it's narrow enough not to interfere with the fit of the leg openings. This is really a wonderful, high-value (very useful) item. If you buy these when baby is young, you can keep using them all the way to potty training for a truly excellent value. 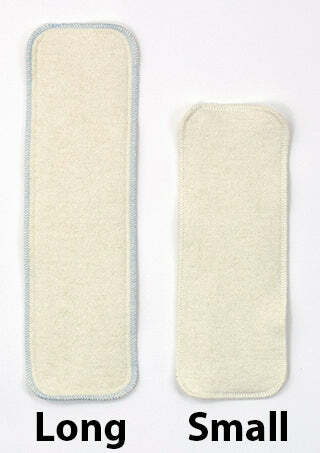 The size long gives you some more absorbency for an older baby. Made in the USA of imported material. Both the cotton and hemp are said to be organic, according to our fabric supplier, but at this time they are uncertified. Note: if you like to use borax a lot, choose 100% cotton instead of hemp. Cut and sewn in the USA of imported material (all hemp is imported. There is no such thing as hemp that is made in the USA as far as I know; most places leave off that tidbit about the fact that the hemp is imported). Custom made for Green Mountain Diapers by a grandma for over 12 years. Her sewing work is wonderful. Since there is just one person sewing these we sometimes sell out of them faster than she can sew them. I apologize for the occasional times that they are out of stock. When this happens it is usually only for a short time so check back again soon. Unlike the cotton Cloth-eez Doublers these doublers lay flat after washing. The Sherpa Doublers also lay flat nicely, but these are more absorbent than the Sherpa Doublers. The Sherpa is usually softer than the hemp however. Everything has trade-offs. These Hemp Doublers are also available in a Stay-Dry version. We have been purchasing from GMD since before our son was born 4.5 years ago. LOVE them! We are now at the stage of a potty trained 3 year old that still needs a diaper at night. She is a heavy sleeper and a pretty heavy wetter too. We used the hemp doublers with prefolds or as inserts when they were younger. Now we are using them tucked into a kite fold flat inside the thirsties sized diaper cover and it is the PERFECT nighttime toddler solution. We use these inside a pad-folded prefold, topped with a fleece liner inside Best Bottoms, Buttons, or Grovia covers for overnights, with no leaks or rashes even at 12 hours. Probably haven’t used these to their full potential, but they’re great in my prefolds when I know I have to run out and need just that little bit more absorbency for my son. 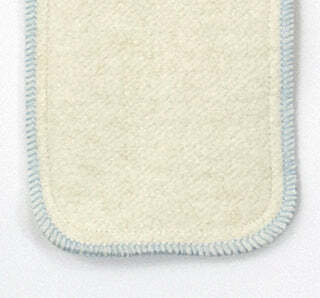 Bought six of these to stuff in our pocket diapers (along with a faster absorbing microfiber liner). I got the longer liner despite my daughter being relatively small since I figured they’d last longer - very glad I did, they shrunk down to being the same size as her microfiber liner. They are extraordinarily absorbent though and less bulkier than her bamboo liners - she now makes it through the night with one diaper. Would definitely buy them again.